These photographs show the tree before the library was open to the public. Special art pieces designed for the Library & Children's Health Hub by David Truebridge. The Tree sculpture and the Tāwhaki create wonderful visual imagery while providing wood features which reflect Rotorua’s Forestry industry. 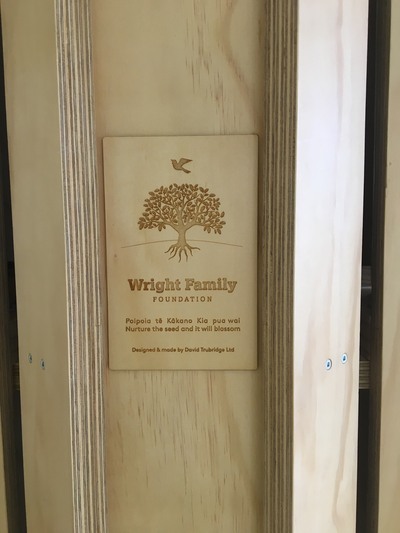 The Wright Family Foundation funded both sculptures which were designed and built by David Trubridge. Tree Sculpture - Tāne: The Tree also evokes the story of Tāne-Mahuta, the Māori God of the Forests. It was Tāne Mahuta who, at the beginning of all things, separated his parents Ranginui (the sky father) and Papatuanuku (the Earth mother) to bring light into the world. It is said by some that Tāne climbed the heavens searching for the three sacred kete or baskets of knowledge (and in some versions two sacred stones). These kete were known as: Te kete-aronui, Te kete-tuauri and Te kete-tuatea. Tāne made his way up through the heavens using Te Aka, the Aka being a vine from a type of climbing plant. Upon passing all kinds of adversity Tāne reached the top most heaven where he was awarded the three kete, which he carried back down to earth. It was these events that earned him the name Tāne Te Wananga. In many tribal areas it was Tāwhaki rather than Tāne who climbed the Aka and retrieved the baskets of knowledge. For this reason, Tāne Mahuta and Tāwhaki are both represented here. On the ground floor the Aka can be seen reaching from the ground up into the roof and crawling along the ceiling, symbolising the journey to obtain knowledge and health.